The GasSens A14/A11 Modular Gas Detector is a flexible component system providing a variety of options to meet individual gas detection and alarm requirements. Multipoint sensor is capable of measuring toxic gasses in up to 12 locations. 32 separate gasses can be detected with the GasSens Detector. The GasSens A14/A11 Modular Gas Detector is a flexible component system providing a variety of options to meet individual gas detection and alarm requirements. From chemical and petrochemical plants to food processors, the GasSens system can be applied to the simplest or most complex gas detection application. Economical and low maintenance, this system is your best choice for reliable gas leak detection. GasSens gas detection systems consist of individual modules that can be located where required. Sensor/transmitters, located in the area where gas leakage or buildup might occur, provide the basic measurement for the system. 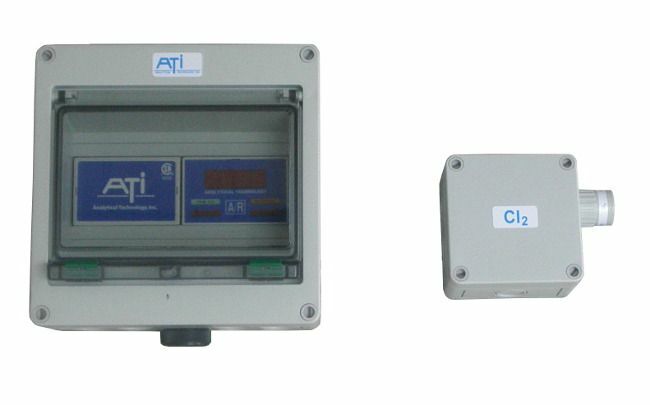 Sensor transmitters are available in either NEMA 4X or explosion-proof versions and can be supplied with ATI’s exclusive Auto-Test automatic gas sensor testing system, greatly reducing operator testing requirements. Receiver modules provide the electronic brains for the gas detection and alarm system. Each compact module includes a digital display of gas concentration, isolated analog output, and 4 relay outputs. Receivers may be located up to 1000 feet from sensor/transmitters for remote indication, or can provide local control functions such as valve shutoff while transmitting a 4-20 mA signal to remote displays or data loggers. Standard unit operates on 12 VDC power only. Optional universal power supply modules provide DC power to receivers. The power supply is housed in a compact module similar to the receiver, and will accept inputs from 85 to 265 volts, AC or DC, without adjustment. The power supply also provides a power failure relay and charging for an optional battery back-up unit. Note: The GasSens A14/A11 is highly customizable to fit your every need. Please review the options closely to ensure you choose the right configuration for your application. Please call if you have any questions or need help configuring the right sensor for your application. Gas generators permanently installed on the sensor verify sensor operation by providing a “bump test” of the sensor from daily to once a week. See what sensors can use the specific Auto-Test Generators from the chart at the bottom of the product page. LED Display: Indicates gas concentration directly in PPM, PPB, or %. The display may be operated in high intensity (sunlight readable) mode for outdoor use or in normal mode for indoor applications. Three Alarm Relays: Output relays are SPDT with unpowered contacts for use in activating external signaling devices, control elements, or for input to telemetry or annunciator systems. Each relay may be assigned to either alarm set point for application flexibility. Relays are factory set to energize on alarm, but may be switch programmed for fail-safe operation. Relays may also be set for either latching or non-latching operation. Trouble Alarm & Relay: Should the sensor/transmitter input be lost, a trouble light (LED) on the front panel will flash and an associated relay will activate. For those systems equipped with the sensor Auto-Test feature, this alarm will also activate if the sensor does not respond to the automated gas test. Front Panel Reset Switch: A single front panel switch marked A/R (Acknowledge/ Reset) serves a number of functions. When an alarm occurs, the switch will silence an audible horn wired to the module and will change the alarm lights from flash to steady on. After the alarm condition has cleared, the switch may be used to reset any latching alarms. The switch will also activate an electronic module test, inhibit alarm contacts, and activate the Auto-Test. Remote Reset Input: Terminals are provided for connection of a remote reset switch so that alarms can be acknowledged from a remote location or through a telemetry system. Pluggable Terminal Blocks: External electrical connections are made to plug-in terminal blocks. Should module service ever be needed, modules can be replaced in minutes. 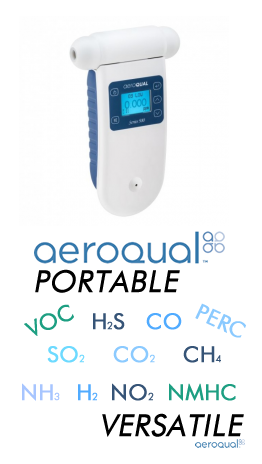 Accuracy Generally ±5% of value, but limited by available calibration gas accuracy. GasSens gas detection systems employ electrochemical sensors developed and manufactured by ATI. Expertise in electrochemistry and sensor design provides the foundation for leak detection systems that perform continuously with minimal maintenance. Sensors are rated for ambient temperatures from -25° to +50°C, allowing both indoor and outdoor applications. Excellent zero stability and high sensitivity and selectivity combine to make ATI sensors the best available on the market today. Gas sensors are closely coupled to a digital transmitter for excellent noise immunity and the ability to transmit long distances using unshielded cable. The transmitter is powered from the receiver module and uses a unique current pulse position technique to send information to the receiver over a two-wire connection. The receiver connection is not polarity sensitive, virtually eliminating the possibility of incorrect transmitter wiring. Sensor/transmitters can be located up to 1000 feet from receiver modules. Sensor/transmitters are housed in shielded NEMA 4X enclosures for use in almost any industrial environment and are designed to meet intrinsic safety standards. An explosion-proof version of the transmitter is also available for applications where this type of protection is preferred. 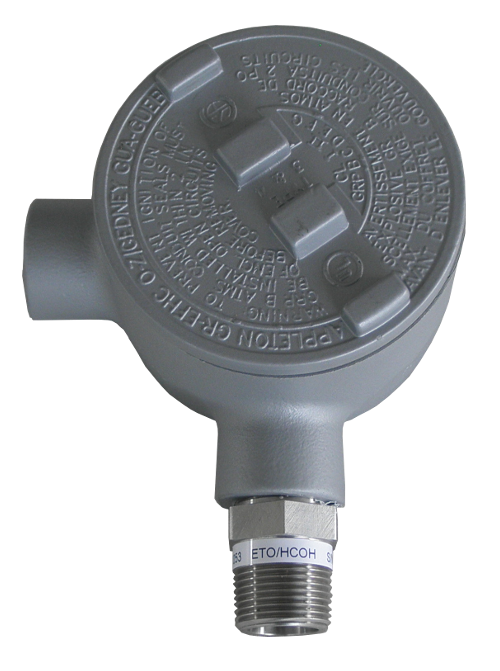 Combustible gas transmitters are always explosion-proof.